In 2015, WHO estimated that about 21% of Slovenia’s population smoked. If tobacco control efforts continue at the same intensity, WHO projects that in 2025 this will have fallen to around 18% of the population. These figures indicate that meeting the global 2025 noncommunicable disease target of a 30% relative reduction in prevalence of current tobacco use in people aged 15 years or more by 2025 is possible if action is taken now. These messages resonated at the national conference held in Slovenia on the occasion of World No Tobacco Day 2018. The Ministry of Health, the National Institute of Public Health and the WHO Country Office in Slovenia jointly organized the event. 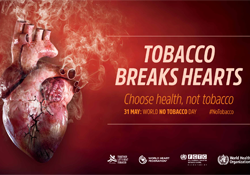 Referring to the 2018 theme of World No Tobacco Day in her address at the conference, Kristina Mauer-Stender, Programme Manager of Tobacco Control at WHO/Europe, pointed out that despite the devastating harms of tobacco to cardiovascular health, the general public does not know that tobacco is a leading cause of cardiovascular diseases. Tobacco use is an important risk factor for the development of coronary heart disease, stroke and peripheral vascular disease. A year ago, Slovenia adopted one of the world’s strongest acts to reduce smoking. In line with the WHO Framework Convention on Tobacco Control, it contains evidence-based, high-impact interventions such as standardized packaging, a total ban on advertising and sponsorship, and price and tax measures to reduce the demand for tobacco. Translating all provisions into practice requires the hard work of many dedicated people from all sectors – health and non-health, governmental and nongovernmental – including high-level politicians. Threats to further progress include complaisance, distraction, and change or lack of leadership. Darina Sedlakova, Head of the WHO Country Office, referred to the strong leadership in Slovenia for smoking reduction. She highlighted the great contribution of Minister of Health Milojka Kolar-Celarc in not only adopting the law but also consistently supporting its implementation. In recognition of this outstanding work, representatives of Slovene civil society together with the WHO Country Office presented the Minister with an award. The major work ahead in Slovenia involves monitoring the tobacco industry and honing the skills required to eliminate its practices of advertising novel products for smoking and selling them to minors or as medical aids for smoking cessation. Numerous surveys have shown that there is a need for stronger regulation of novel nicotine products, such as electronic cigarettes. Careful attention to controlling the observation of legislation in practice is also needed. Through the joint work envisioned in the biennial collaborative agreement between WHO/Europe and the Slovene Ministry of Health, a series of policy briefs and anti-tobacco promotional materials have been published. Slovene experts will also receive training on monitoring the tobacco industry, and renowned experts from abroad will assist Slovenia in the economic and fiscal issues related to tobacco. WHO will continue to support Slovenia on its way to a smoke-free society.